This is my third time to make/remake a tunic from this wool plaid fabric. I hate to give up on something you know? The first time I made a simple sleeveless high/low shift with a few pleats at the neckline to create some drape. When I wore it a friend commented on how I always wore such baggy clothes. Ooomph. That hurt. So I remade it, by slicing it down the front and putting on a button band. I also tightened the back up with a pleat. The back was really nice. But I still didn’t care for it. This fabric is drapey and I always thought it needed pleats or gathers or something. You can see it here. 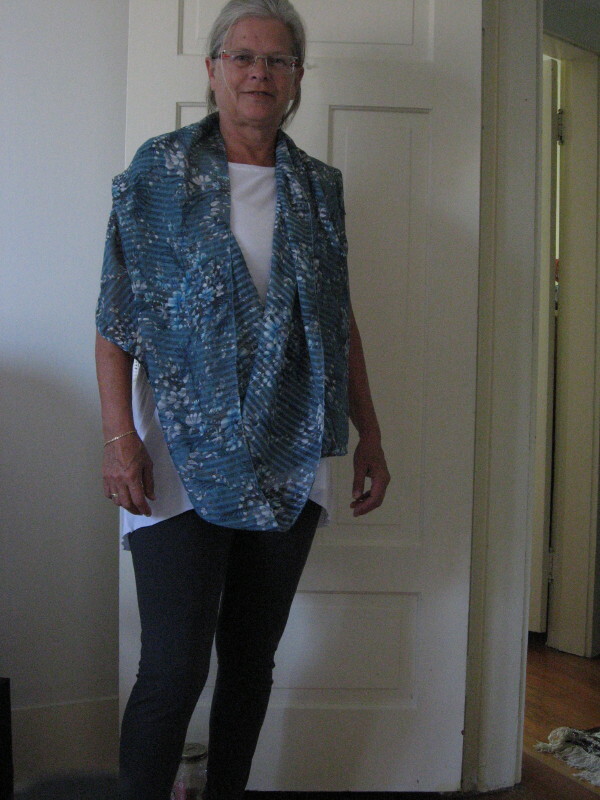 I thought it would be nice to make a tunic like this. I had quite a bit of fabric left over and first I wanted sleeves. But after making sleeves I realized there wasn’t enough fabric left to add a gathered skirt all around. So I thought about the Grainline Alder, a pattern I’ve looked at several times, unsure if I liked it or not. Probably everyone has seen the Alder, which has two versions. In one version, the back is gathered. I went to the Grainline site and found the online tutorial for that version. It was pretty easy to follow it even without the actual pattern. That left doing something about the neck, which I had cut too big the first time. There’s not that much you can do when you’ve cut the neck hole too big. I decided to line up a bunch of scraps, sew a gathering stitch, gather them and pin them between the neck and the facing. I left their edges all unfinished. Go edgy or go home right? Then I decided I didn’t want to hem the bottom either, so I just serged around the bottom. I also did a wrist treatment of gathered scraps. So this is the result. The body is very much like the Alder. I love the sideview, and the back. But the front? I’m just not a shirtwaist kind of a person …. I could have sworn it looked better in real than in this pic. And should I trim down the neck flounce? It seems kind of overwhelming. This is warm and toasty and pretty comfortable. And I’ll wear it this winter partly to keep in view this kind of look that I’ve never had before. Do you know what i mean? There are so many things I like about this, but I’m thinking it’s still a fail. Luckily (!!) the fabric picked up a couple of small moth holes during the last year, so this is doomed anyway. I knew that going in, so this was an exercise in experimentation to see if I could find my way to a great look. I’m interested in any comments or suggestions about what’s wrong and why. I ended my last post by saying I’d be refashioning a table cloth for next time. I just can’t use that horrible, horrible phrase, “and now for the big reveal”. I can’t. You know?? It must be the ugliest phrase in the English language. So, anyway, this is me, dressed in a table cloth. It was a huge tablecloth, which I found at the local Sally Ann (does everybody know that nickname for the Salvation Army?) I almost left it behind (afterall, I didn’t know its provenance) but it was a fabulous, floppy, snow white cotton jacquard. It’s so hard to find nice cottons in Vancouver. Ninety percent of the cotton fabrics in town are quilting cottons, and maybe 8 percent are standard, basic, boring shirting fabrics. Which leaves the odd nice bolt scattered among the six fabric stores. So, I imagine it covering the long rectory table in some vicar’s cottage next to the oldest church in town, lilacs and violets in chrystal vases on its surface. Provenance, done. The top is the first pattern I ever purchased through Pattern Review, because of reviews I saw at the site. When I received the pattern, and saw the envelope pix, I realized I would have overlooked it in the pattern book. It really doesn’t look like much. It’s Butterick 6024. I made a few changes. I raised the front and back neckline a bit. I replaced the elastic at the sleeve ends with a flat cord. I changed the hem design. The pattern has the front hem straight across, with a dip occurring only in the back panel. I cut the front and back to have the dip start in the front. A much nicer look, if you ask me. The pants (shortened because I couldn’t get the whole length out of the table cloth after I’d cut out the pieces for the top) are burda 7400, which is a pattern I used once before. As I was laying out the (two) pattern pieces, I realized that I had mistakenly cut one of them for a size xxxxl! No wonder the previous pants I had made just weren’t right. The pattern shows wide ribbing folded over at the waist. I didn’t do that the first time, and I didn’t do it this time either. Instead, I cut a rectangle and made a casing for elastic, sewing the casing to the top of the pants. It worked well. I have such a small difference between hip and waist that there isn’t much bunching. I may add belt loops so I can wear a belt with them too. I was so happy with these pants that I immediately took apart the previous pair I had made, cut away about an inch and a half from each of the two back pieces and sewed them back together. I like this pattern because it’s a great compromise between fitted pants and elastic waist pants. The pants fit pretty close to the body, and a belt hides the elastic waist casing. The side seams are not at the sides, but closer to the front. That means the pockets lie flat and won’t bulge out at the sides. These are obviously not “good” pants, but they are a general utility pant more comfortable for me than blue jeans. I love the green “railroad” stripes. For my next pair, I may put in a fly. 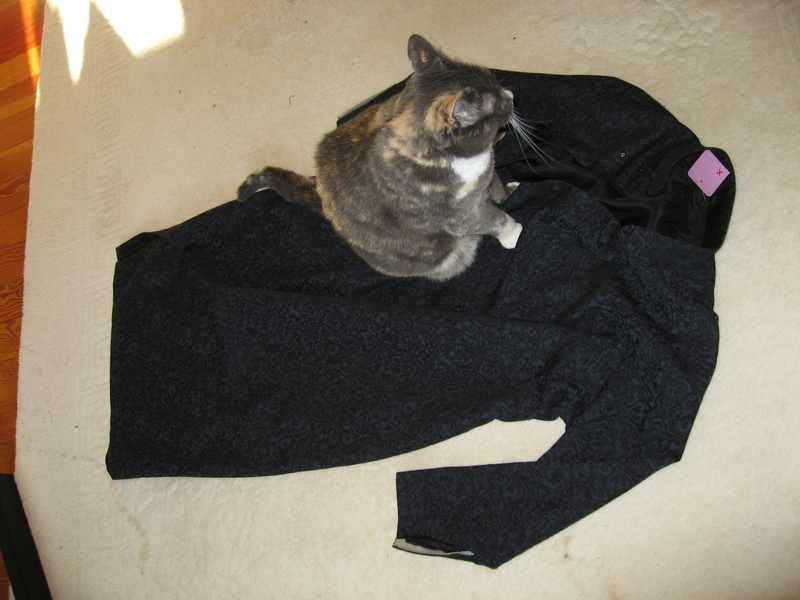 This is not a post about a coat. You may have noticed that from the title. My next post was supposed to be about a coat, but I’ve been waiting and waiting and waiting to finish the coat so that I can blog about it and this morning when I read the remaining instructions I realized that although I’ve sewn up the whole coat, and the whole lining, there are still about half a dozen steps and they’ll take me daaaaaaayyyyyyys to finish. I’ve been dying to write a post. I realize I could write a WIP about the coat, but it’s kind of too far along for that. So I was gloomily pondering how to write a post about a non-existent garment as I took my daily stroll this late afternoon. I stopped into a second-hand clothing store, not to buy anything, but who knows they might have something that I might like for its fabric, I thought. It was late afternoon and a staff member was vacuuming around my ankles when I saw a pretty nice looking sweater. I’m allowed to buy a sweater, I figure, since it’s still uncertain about whether I’ll tackle any knitting this winter and if I do knit a sweater, it’s a toss up as to whether it’ll be wearable. So I was looking for the label to find out what it was made of when I saw a “TOPSHOP” label. I wouldn’t know anything about that, except that I’ve seen my British blogging compatriots occasionally mention “going to the High Street and stopping for a look at Topshop”. I’ve never been entirely sure what that sentence means. So my pulse starting racing a bit because it reminded me that I blog internationally (we all do, of course, but doesn’t that sound just so ‘wow’?) and if only I could write a post about something …. Well. I tried the sweater (jumper to you Brits) on and it felt fabulous but was too big overall, and too short in front. But it felt fabulous. It’s a great wool fabric. A brilliant colour. And it’s from Topshop. So I began to think that maybe it was charmingly oversize, you know, maybe it was the “boyfriend look”? I bought it. For $12 CAD — about 4 pounds British I should think — I could wear it indoors when the house is chilly. 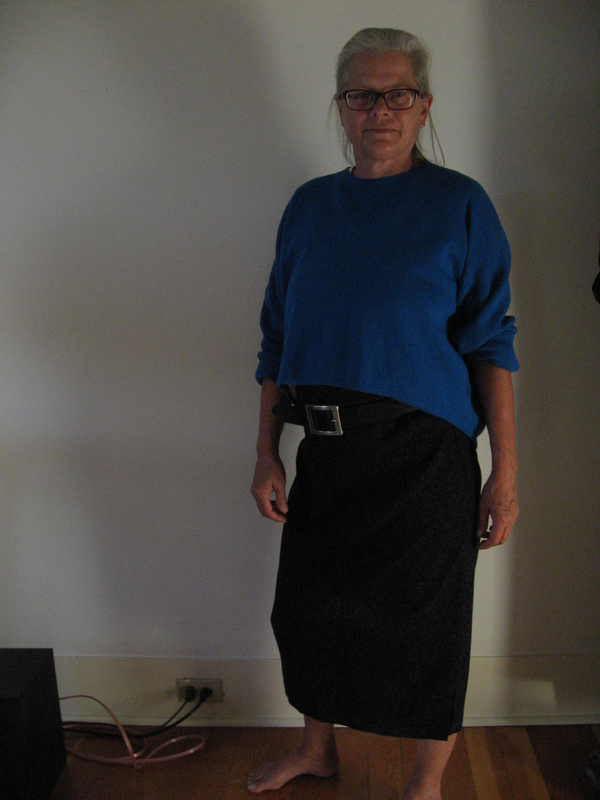 Then I really wanted to blog about the sweater, but this is a sewing and sometimes knitting and refashioning blog, not a “what I found at the thrift store” blog, so I considered what I could put with it that involved sewing. Then I remembered the pair of Chinese dresses that I bought a few years ago at a thrift store sidewalk dollar rack. They were both obviously handmade out of fine British woolens, with China silk linings. For a woman about my height but somewhat chubbier. Possibly never worn, smelling a bit mothballish. I wondered what had led them to their sad fate in a rack of ragged, worn-out, desolate cast-offs. I wondered if the previous owner had had a few fine dresses made in Hong Kong before immigrating to Canada, but once she got here, decided she’d rather purchase a brand new wardrobe from Holt Renfew. I imagined her in flashy high-end labels smoking cigarettes in an ivory holder at the mahjong tables. Or else she died. Relatives, cleaning out her house, boxed them up and brought them to a thrift store. Either way, there’s a story to those dresses and I didn’t want to leave them to the sidewalk trash. It seemed to dishonour whoever they belonged to to leave them there. I made a sleeveless jacket out of one of them, but the other has been hanging on a closet hook, waiting for inspiration. There’s my cat, finding inspiration. I’ve tried to get her into pictures before, but forgot that all I have to do is lay some fabric on the floor, and she climbs right on board. Way to go, Holy Smoke. Earlier in the summer I slid the dress down my hips and discovered the wider tummy part fit my hips, and the narrower part just below the bust fit my waist. I could cut in just above the side zip, right under the underarms, put in a facing and have a skirt. 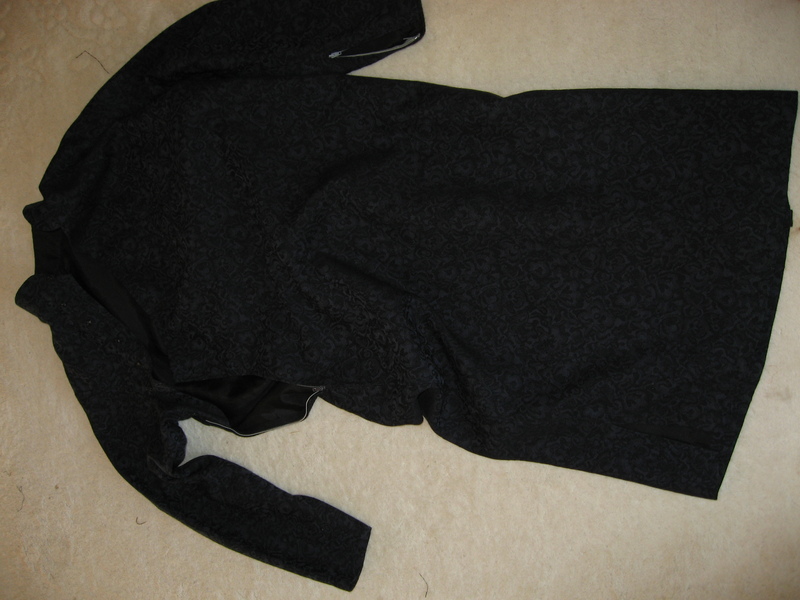 I put it aside for a winter project, and yesterday, with the new sweater under my arm, I pulled the dress off the hook, laid it down and took the scissors to it. I haven’t done any of the sewing yet. There’s enough extra at the waist for a few darts, but that, plus making a facing is all I need to do. 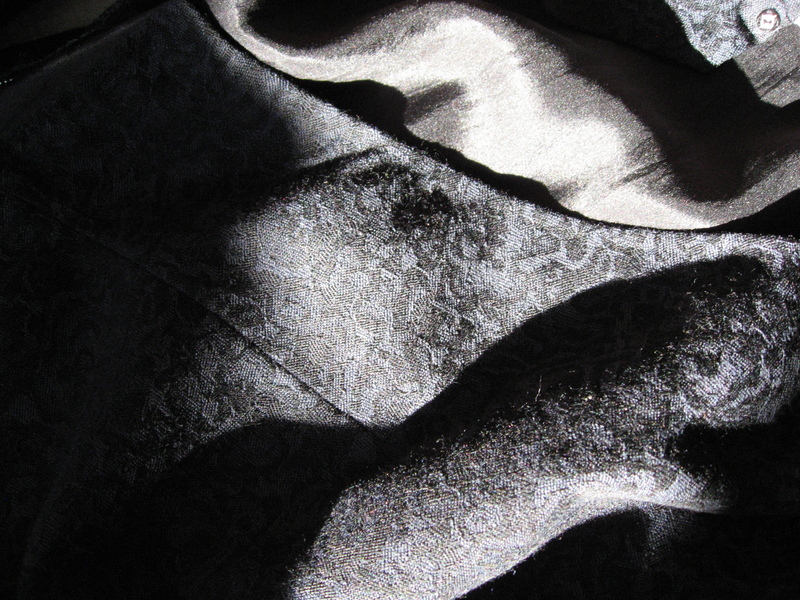 I still don’t know whether this fabric is black, or blue and black. In my youth I would never have worn the blue of this sweater — I wasn’t really a fan of jewel tones and blue was my least favourite colour. Today I love it. Maybe it’s the greying hair? I’ve tried on what remains of the dress, by the way, the sleeves and shoulders, and I think that with the addition of a bit of trim, I can wear it as a shrug. Then I’ll have used the entire thing, wasting nothing. What kind of store is Topshop anyway? We’ve had Marks and Spencer here in Canada, but that’s the only British chain I know. 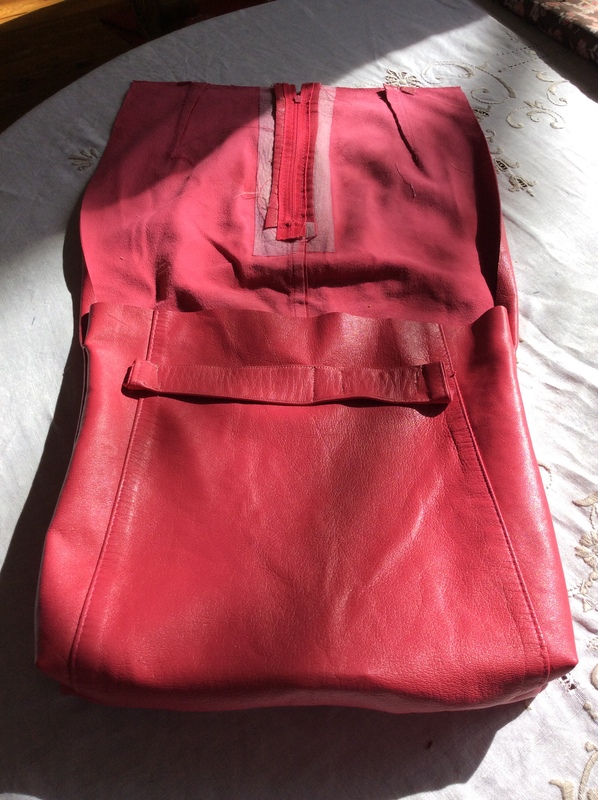 I made this leather bag from a skirt I’d received from a colleague at my “exit” party from my previous place of employment. The colleague took me seriously when I invited people to give me any kind of fabric at all, even items from thrift stores that I could take apart. I envisioned plus-size dresses or long skirts, things that would have plenty of useable fabric. 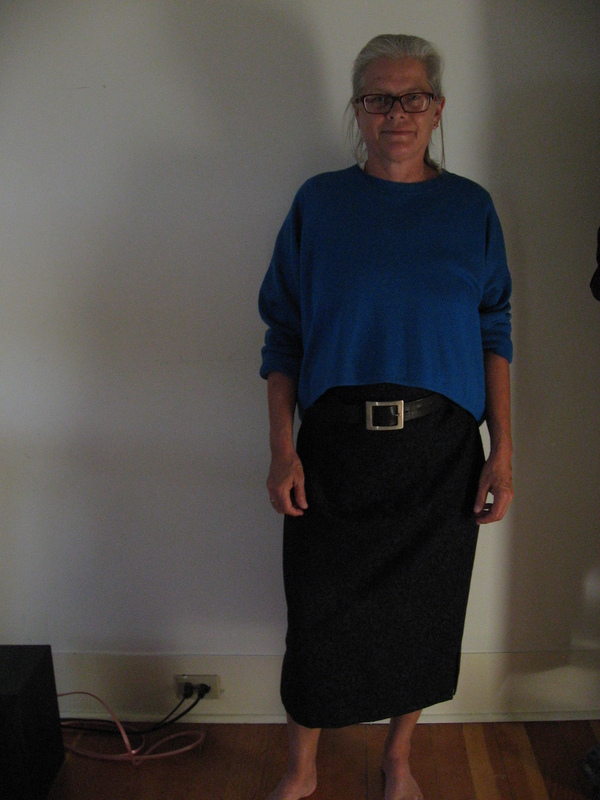 P. gave me a size 4 pencil skirt with top-stitched panels. Uh huh … leather underpants maybe? Or, I know, a clutch of leather thongs! I went round and round with tape measure and pencil to see if I could make a vest out of it. Finally I decided on the bag. Or purse, as some would call it. I’m not a purse person. For much of my life I got away with using my pockets for essentials. Eventually I needed a large bag for work to hold books and files, and that was okay. And in recent years I’d started carrying a backpack. For some reason I don’t always have pockets in my clothes anymore, and I seem to develop holes in the pockets of my coats. So this is a bag. Not a purse. Terminology is important! There were lots of firsts in the construction of this bag. It was my first time to make square corners, my first time to sew with leather, and my first time to try making a bag. There are lots of imperfections in the finished product, but I’m happy with it and I learned a lot. For example, I learned that the unfinished side of leather (the suede side) won’t cooperate with the sewing machine feed dogs. And that my sewing machine can handle three layers of leather, but four would be stretching it. And that a walking foot attachment is a miraculous thing! A few details about the process: since I was lining the bag, I got to start with that rather than tackling the leather first thing. For the lining I used another piece of fabric given to me by a colleague at that same “exit” party. 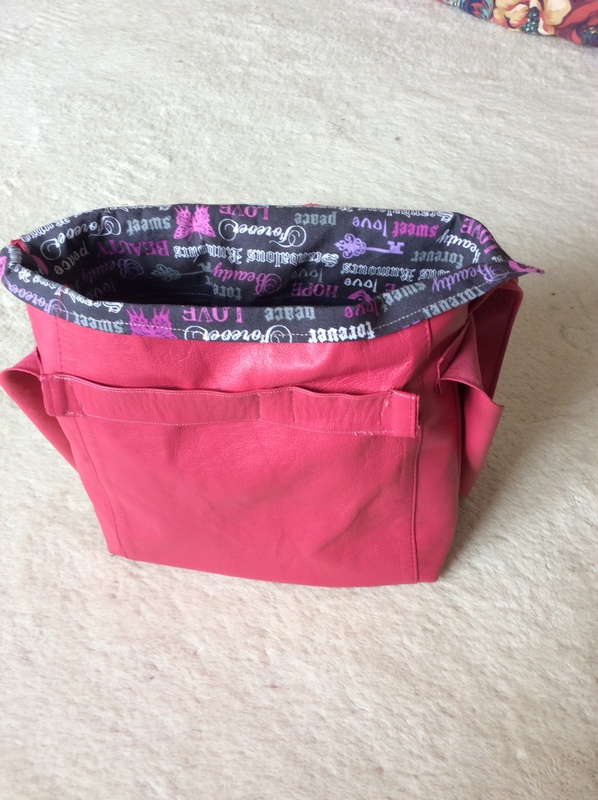 I decided to make a zippered pouch on one side, and a double non-closing pouch on the other side. That’s the lining facing outward instead of inward, as it does once inserted into the leather shell. Cute fabric, eh? 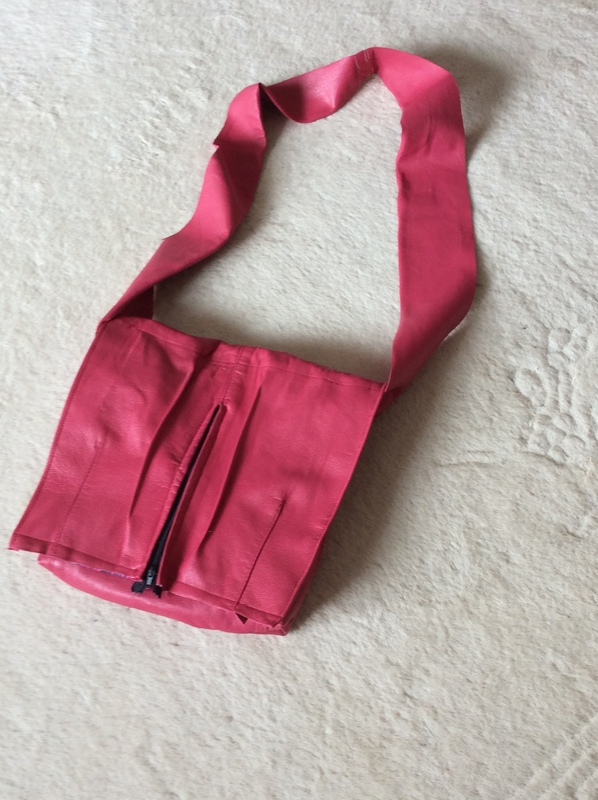 🙂 Here’s a picture that shows that one side of the bag, the side with the flap, is made from the back of the skirt. I didn’t like the fact that the back of the skirt bagged out, so I sewed a couple of decorative welts parallel to the zipper and that worked well. And of course, when I cut off the waistband of the skirt I took the chance that the zipper pull would slide right off, and inevitably it did, so I had to swap it out. 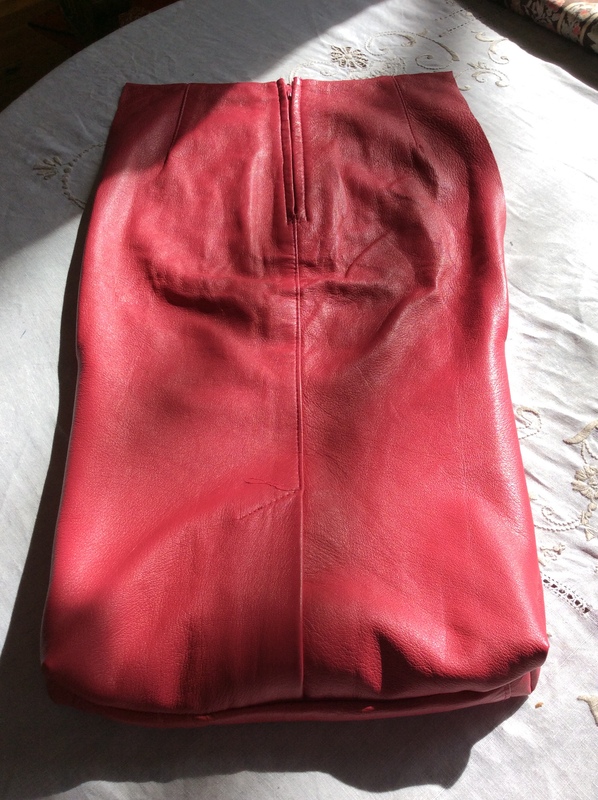 I made a storage compartment behind the zipper too by sewing another piece of leather behind before adding the lining. One of the great things was seeing how wonderfully my almost brand-new walking foot functioned. I attached it when I needed to sew more than just two layers of leather together and wow did it ever do the job. I’m curious about how often other sewists use a walking foot — I’m not talking about quilters who, I think, buy sewing machines with permanent walking feet. I also bought sewing clips (which look exactly like large clips you use to bundle papers together) for this project because there were places I couldn’t use pins. I like the clips (mine are in five pastel shades, rather than standard black), and intend to see where I can use them in future projects to save the bother of pinning. I wonder if any sewists have moved completely to clips from pins? So that’s it. One smallish courier bag, big enough for wallet, phone, keys and a book or e-reader. What else does anyone need to put in a bag anyway? As an older babe, I have some history. 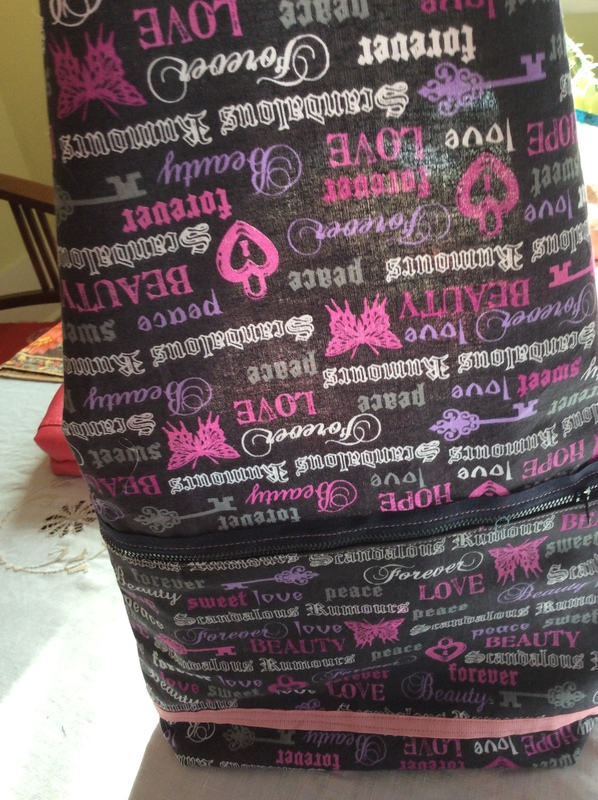 I also have a bit of baggage, and amongst that baggage there are a few clothes that I’ve carted from place to place for over thirty years. In 1979 I was a gauche, naive, even ignorant kid from southern Ontario, quite suddenly transported to the foreign enclaves of Beijing, where I was expected to be be matron of a home, representative of my country, frequenter of diplomatic and media dinners and fetes. I had a week in Hong Kong to find a dress. Unfortunately I had no experience at all with fancy dress, so when some other ex-pats suggested having one made, I walked into the nearest dress-makers, chose a lovely silk fabric and a pattern and walked out. I wore the resulting dress weekend after weekend for a year. When I left China, I put it in a trunk. Every few years I looked at it. I returned to the life of a student, which didn’t offer any opportunities at all for such formal wear. Eventually I ripped out the lining, which had become stained. Then I separated the gathered skirt from the bodice. But I still couldn’t think of anything to do with it that would allow me to wear the fabric. Last week, I had an oddly delayed reaction to the knitting I took up last year. Knitters have been making “infinity” scarves lately. If you don’t know, they’re just a circular scarf, maybe with one twist. So here’s what I did with the skirt. I simply hemmed the edge that had been gathered and joined to the bodice and threw it over my head.